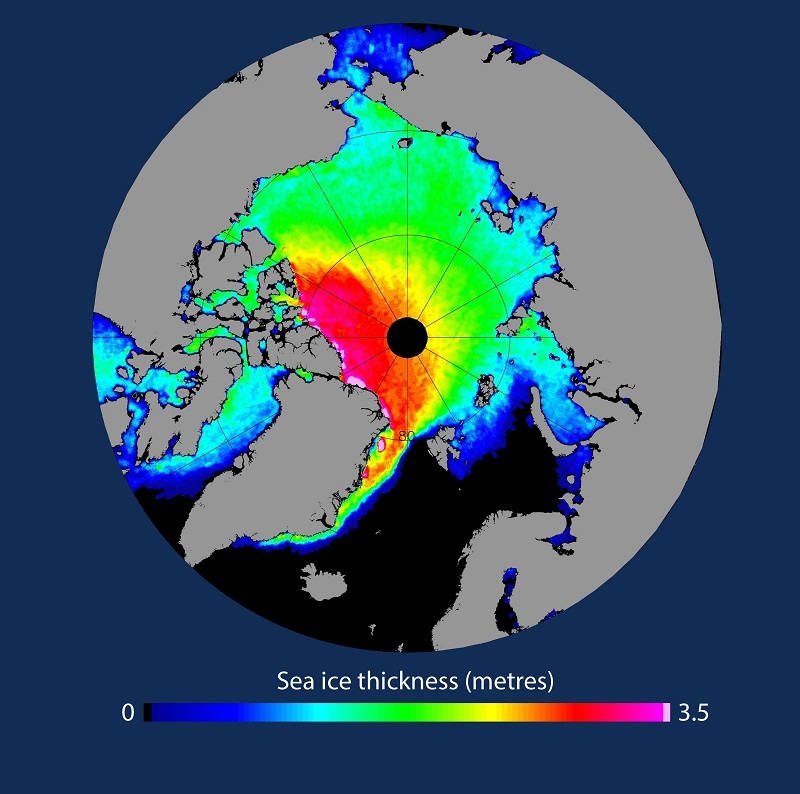 Remote sensing over the Polar Regions has poked its head above the ice recently. On the 8th February The Cryosphere, a journal of the European Geosciences Union, published a paper by Smith et al titled ’Connected sub glacial lake drainage beneath Thwaites Glacier, West Antarctica’. It described how researchers used data from ESA’s CryoSat-2 satellite to look at lakes beneath a glacier. This work is interesting from a remote sensing viewpoint as it is a repurposing of Cryosat-2’s mission. It’s main purpose is to measure the thickness of the ice sheets and marine ice cover using its Synthetic Aperture Radar (SAR)/Interferometric Radar Altimeter, known as SIRAL, and it can detect millimetre changes in the elevation of both ice-sheets and sea-ice. The team were able to use this data to determine that the ice of the glacier had subsided by several metres as water had drained away from four lakes underneath. Whilst the whole process took place between June 2012 and January 2014, the majority of the drainage happened in a six month period. During this time it’s estimated that peak drainage was around 240 cubic metre per second, which is four times faster than the outflow of the River Thames into the North Sea. We’ve previously highlighted that repurposing data – using data for more purposes than originally intended – is going to be one of the key future innovation trends for Earth Observation. Last week, ESA also described how Sentinel-1 and Sentinel-2 data have been used over the last five months to monitor a crack in the ice near to the Halley VI research base of the British Antarctic Survey (BAS). The crack, known as Halloween Crack, is located on the Brunt ice Shelf in the Wedell Sea sector of Antarctica and was identified last October. The crack grew around 600 m per day during November and December, although it has since slowed to only one third of that daily growth. Since last November Sentinel-2 has been acquiring optical images at each overflight, and this has been combined with SAR data from the two Sentinel-1 satellites. This SAR data will be critical during the Antarctic winter when there are only a few hours of daylight and a couple of weeks around mid-June when the sun does not rise. This work hit the headlines as BAS decided to evacuate their base for the winter, due to the potential threat. The Halley VI base, which was only 17km from the crack, is the first Antarctic research station to be specifically designed to allow relocation to cope with this sort of movement in the ice shelf. It was already planned to move the base 23 km further inland, and this was successfully completed on the 2nd February. Further movement will depend on how the Halloween Crack develops over the winter. Finally, the Multidisciplinary drifting Observatory for the Study of Arctic Climate (MOSAiC) project was announced this week at the annual meeting of the American Association for the Advancement of Science. Professor Markus Rex outlined the project, which will sail a research vessel into the Arctic sea ice and let it get stuck so it can drift across the North Pole. The vessel will be filled with a variety of remote sensing in-situ instruments, and will aim to collect data on how the climate is changing in this part of the world through measuring the atmosphere-ice-ocean system. These projects show that the Polar Regions have a lot of interest, and variety, for remote sensing. This entry was posted in CryoSat-2, Data, Earth Observation, Education, ESA, Remote Sensing, Space Can Help, Space Industry and tagged British Antarctic Survey, CyroSat-2, data, ESA, Halley VI, lakes, MOSAiC, Multi-disciplinary drifting Observatory for the Study of Arctic Climate, polar, polar regions, remote sensing, repurposing, SAR, Sentinel, Sentinel-1, Sentinel-2, SIRAL, sub glacial, The Cryosphere, Thwaites Glacier by Andy. Bookmark the permalink.